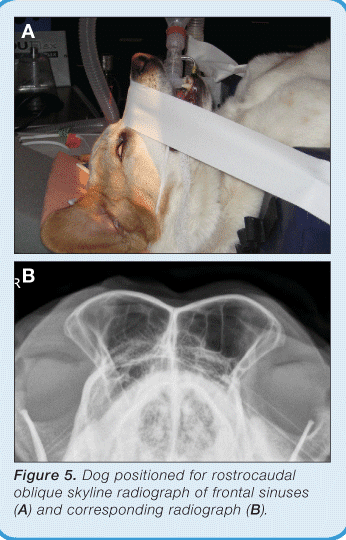 In this article, the authors provide guidance on ensuring high-quality, correctly positioned and collimated small animal skull and nasofacial radiographs, paying close attention to small details of anatomy. The anatomy of the skull and nasofacial area of the dog and cat is complex, with cavities, sinuses, mandible, maxilla, dental arcades, and cranial cavity. In the 2-dimensional radiography image, the 3-dimensional skull creates a complex series of lines and superimposed osseous structures. Radiography of specific areas requires close attention to small details of anatomy that will aid in proper positioning for each image. Improperly positioned radiographs can lead to anatomic distortion of normal skull anatomy, resulting in summation shadows unfamiliar to the reviewer of the images, and possible false-positive diagnoses of abnormalities. 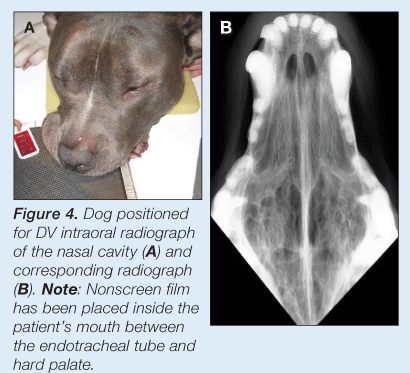 Projections made during the standard imaging series of skull radiographs require the dog or cat’s mouth to be open when an exposure is made. 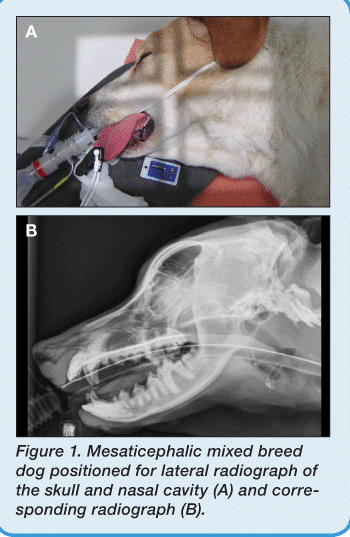 When radiographing a trauma case in which mandibular and maxillary fractures are present, a painful animal will not lie still even under heavy sedation. Note: When specific skull fractures are present, or trauma has occurred, placing stress on various areas of the skull to manipulate it for normal imaging positions is contraindicated. 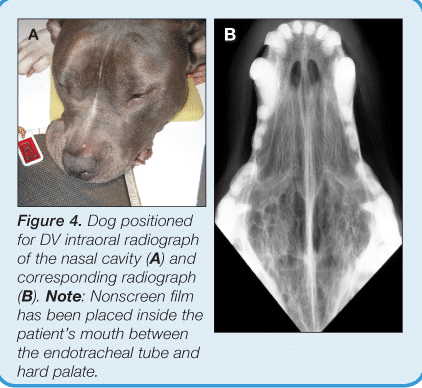 Radiographs of the skull are indicated for evaluation of traumatic injuries, skull pain, epistaxis, soft tissue masses, and for some related problems of the skull and nasal cavity, such as chronic rhinitis and nasal discharge. If advanced imaging is available, computed tomography (CT) can provide more specific and detailed information than survey radiographs. Learn more about indications for CT by reading Advanced Imaging: Its Place in General Practice (January/February 2014), available at tvpjournal.com. High mAs, with longer time station: Lowest mA that allows use of a small focal spot in order to improve geometric sharpness and, thus, ability to see fine osseous detail. For an average dog, the mAs is 10 to 15, with 55 to 65 kVp. Grids: Use if areas thicker than 10 cm are being imaged; otherwise, tabletop technique is recommended. With digital radiology equipment, a grid should be used if areas thicker than 15 cm are being imaged. Although basic positioning is similar, some variation in use of sponges and tape will be required due to different skull sizes and shapes of various canine and feline breeds. Dolichocephalic breeds (ie, Doberman pinscher) have long, narrower heads. Mesaticephalic breeds (ie, beagle) have medium sized and shaped heads. Brachycephalic breeds (ie, bulldog) have short, wide heads, with foreshortening of the nasal cavity and absence of frontal sinuses. Cats have more standard sized and shaped heads; however, some brachycephalic cat breeds (ie, Persian) require the same considerations as brachycephalic dog breeds. The images used in this article feature a mesaticephalic breed dog (mixed breed). Place the patient in right lateral recumbency, with the nose and skull in an extended position. In dolichocephalic and mesaticephalic breeds, place a small rectangle sponge under the tip (end) of the nose to keep it parallel with the table. Place your hand along the ventral mandible, positioning your hand perpendicular to the table and the mandible. Compare the relative level with the mid dorsal aspect of the nasal cavity and the tip of the nose; this imaginary line should parallel the table. Center the central beam to the mid cranium, with the collimator opened to just include the cranium and nasal cavity (crosshairs at level of the eyes). Depending on the dog’s skull type, the crosshairs may be cranial (dolichocephalic), ventral (mesaticephalic), or caudal (brachycephalic) to the eye. If the area of interest is lateralized to one side, place the side of interest closest to the detector in order to minimize geometric magnification. However, oblique projections will be required to highlight this area of interest. Place the radiopaque marker ventral to the caudal mandible, separate from the patient on the table or radiographic cassette. This view should extend from the rostral end of the nose (nasal planum) through the C1/C2 vertebrae. The wings of the atlas (C1) and all aspects of the skull (zygomatic arches, mandible, mandibular condyles, temporomandibular joints, tympanic bullae, etc) should be even and superimposed. 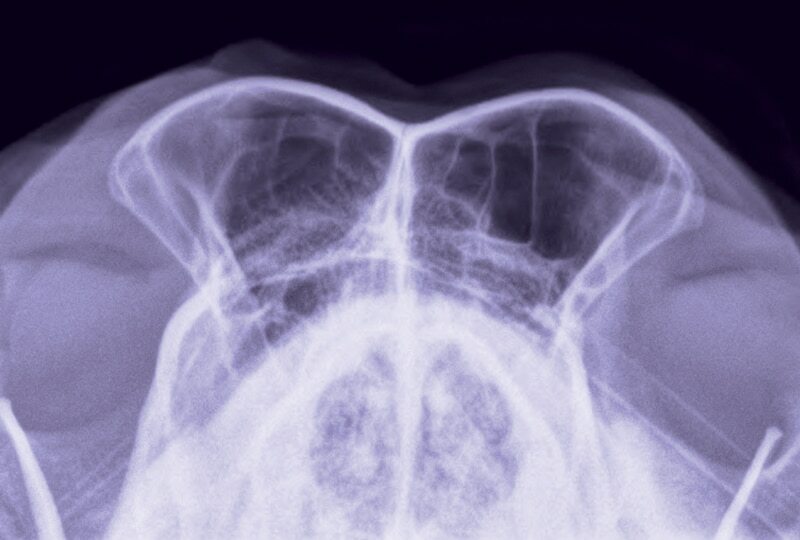 Achieving even superimposition is harder in brachycephalic breeds because their skulls are much wider; therefore, superimposing all structures may not be possible due to geometric distortion from the x-ray beam’s divergent nature. Position the area of interest as close to the film/cassette/detector as possible for best overall detail. Ensure a straight radiograph that is symmetrical (right side and left side). Extend the skull, with the external occipital protuberance resting on a thin sponge to keep the head straight from side to side. Close the mouth and place a piece of tape across the maxilla, caudal to the canines, to keep the head stable, if needed, which will create an artifact over this area. Make sure the ventral aspect of the mandibles and the hard palate, which cannot be visualized when the patient’s mouth is closed, are parallel to the table. Use a positioning trough to help maintain the patient in this position. Extend the skull, with the mandibular rami placed on the table/cassette/detector or a thin radiolucent sponge for stabilization. Place your hands on either side of the skull, feeling for symmetry of the mandible and/or zygomatic arches. Check that your hand position, relative to either anatomic location, is equidistant from the table on both sides. Set the central x-ray beam to the midlevel of the zygomatic arch (at the level of the eyes), with the collimator opened to include the cranial aspect of C1 vertebra, neurocranium, nasal cavity, and just beyond the nasal planum rostrally. Place the radiopaque marker on the right side of the patient, taking care to avoid superimposition over any part of the skull. The rostral extent of the image should be the nasal planum. The caudal extent should be the C1/C2 vertebrae. Make sure the left and right sides of parts of the skull are symmetrically positioned and not obliqued; however, this is almost impossible in dogs and cats that have skull trauma with multiple fractures. Extend the skull, allowing the external occipital protuberance to rest on the table (same as for closed-mouth VD image). Place tape from one side of the table to the other, with the center portion of tape secured caudal to the maxillary canine teeth, which helps keep the hard palate parallel to the table. Place a second piece of tape from one side of the table to the other, starting at the level of the mid abdomen, moving forward and around the mandible’s canine teeth, and taping to the same level on the other side of the table. Open the mouth to full extension so the mandible is caudal to, or at the level of, the maxillary premolars. 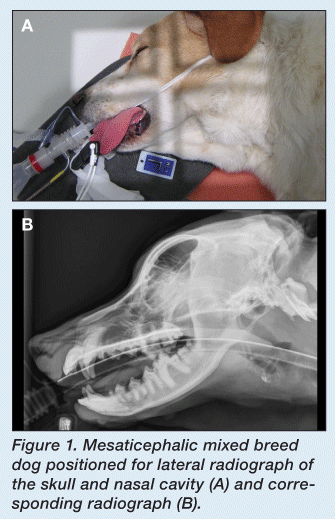 Tape the endotracheal tube with the mandible; care should be taken to keep the endotracheal tube from kinking during this imaging procedure. Center the central x-ray beam in the middle of the hard palate. If possible, angle the tube head 10 degrees, in a rostral to caudal direction, relative to the patient’s skull. If the tube head cannot be angled, do not oblique the patient’s skull to minimize anatomic distortion from geometric magnification. Place the radiopaque marker along the right side of the patient’s skull. The caudal extent should be at the level of the superimposed mandible and osseous structures of the caudal skull. 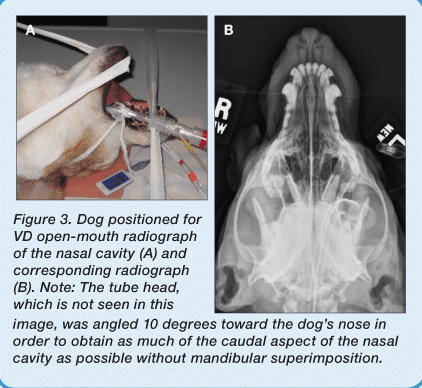 If you have access to nonscreen film (old mammography film) that comes pre-wrapped, or use the edge of a cassette, an intraoral image of the nasal cavity can be obtained with the dog in ventral recumbency. Extend the skull, with the mandibular rami positioned directly on the table, and use a thin sponge to eliminate any degree of mandibular asymmetry. This is the same patient position as described for the DV projection of the skull. To obtain better coverage, place the corner of the nonscreen film in first, which allows it to be positioned further back in the mouth. Nonscreen film that extends beyond the mouth may need support from a sponge to keep it from bending toward the table. Note: Technique for nonscreen film, which must be manually or automatically processed, is 65 kVp and 150 mAs; therefore, the patient needs to be under anesthesia and all personnel kept outside the room. Center the central x-ray beam between the nasal planum and right and left orbits. Place the radiopaque marker on the right side of the patient, within the collimated light beam, taking care to avoid superimposition over any part of the skull. The caudal extent should be to the end of the nonscreen film’s edge (as far caudal in the oral cavity as possible—typically to the level of the cribriform plate). 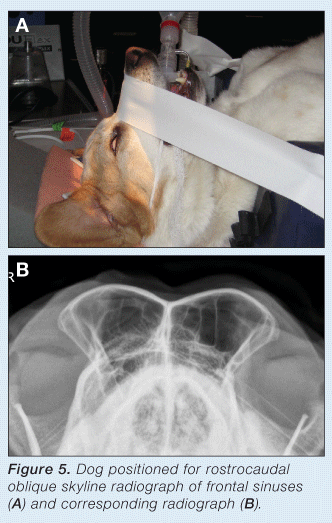 It is important to note that this view is only useful in dogs and cats that have frontal sinuses; brachycephalic breeds do not commonly develop normal frontal sinuses. Use the lateral radiograph (Figure 1) to determine whether frontal sinuses—just dorsal and cranial to the end of the neurocalvarium—are present. If gas-filled sinuses are not present, this projection is not needed. This view is very similar to the open-mouth view, except the nose is pulled caudal with the mandible, which situates the frontal sinuses in a skyline profile. Flex the neck, placing the patient’s hard palate and mandible perpendicular to the table and x-ray collimator system. Place small triangle sponges under the patient’s external occipital protuberance to help maintain a symmetric position on the table. Use tape to hold the patient’s skull in place: flex the skull, place the tape on one side of the table at the level of the abdomen, pass the tape around the patient’s nose, and then fasten the tape to the other side of the table at the same level. If the patient is in a positioning trough, place the tape along the outside of the trough. Over rotating the dorsal aspect of the calvarium, which superimposes the cranial vault and sinuses. Make sure that the nose is perpendicular to the table when viewing the patient from the side. Center the central x-ray beam between the eyes, just dorsal to the bridge of the nose. Collimate on all sides to within a cm of the patient’s skin. Place the radiopaque marker on the right side of the patient. The dorsal extent of the image should be the dorsal skin surface. The ventral margin should be the mid nasal cavity. Make sure to open the field of view to include skin-to-skin margins of the collimated area. Is positioning anatomically correct (Was correct anatomic coverage obtained? ), straight, and symmetric? Symmetry of the skull for VD/DV images is critical when evaluating all structures and osseous anatomy. Once it is determined that the technique is adequate, make sure the appropriate anatomy is present and positioning is correct, straight, and symmetric. Use the figures in this article as a guide as well as the information provided in the Ensuring Image Quality sections. High-quality, correctly positioned and collimated radiographs are critical for accurate assessment of the nasal cavity and general survey of the skull. The projections discussed in this article form the basis for evaluation of other areas, such as the tympanic bullae and temporomandibular joints, which will be addressed in the next article in this column. 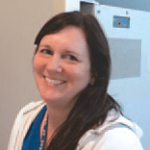 M ary Wilson, RT(R), CT, MR, CV, is a registered radiologic technologist with the American Registry of Radiologic Technologists. 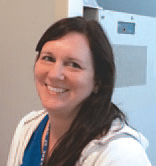 She manages the diagnostic imaging section at University of Florida College of Veterinary Medicine.